Live the backyard lifestyle everyone dreams about, today. 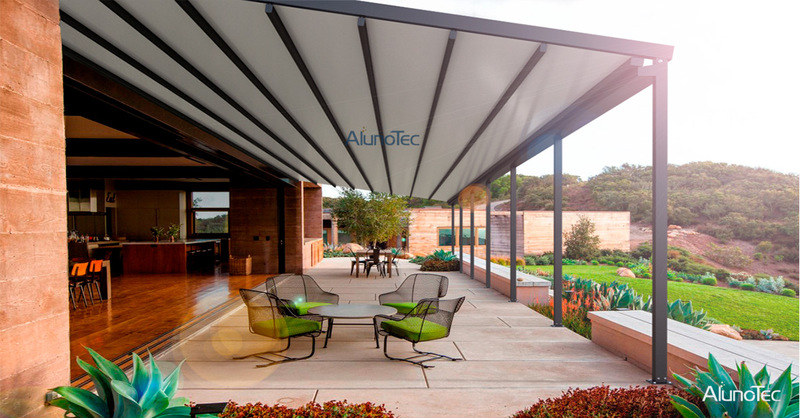 AlunoTec remote control retractable awning pergola system is a good solution for all weather use. Remote control makes your life more easy and convenience. 1. Easy to maintain: the 100% waterproof and fire rated fabric is heat and mould resistant, easy to clean and keeps you relaxing for longer. 2. Waterproof: customised gutters divert even heavy rain to ends and protect your roof system. 3. High-grade stainless steel fittings will endure coastal conditions. 5. The optional LED lighting system create your mood. 6. With auto-wind sensors and remote control motorisation.